HOUSTON, Texas, September 3, 2010 (ENS) – Under the direction of the federal science team and U.S. government engineers, BP has lifted the damaged blowout preventer from its position atop the cemented Deepwater Horizon well in the Gulf of Mexico and replaced it with a fully functioning and tested blowout preventer. 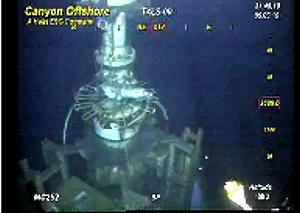 Yesterday, BP removed another set of valves called the capping stack, which was used to shut in the well on July 15. These procedures were undertaken in accordance with specific conditions Admiral Allen set forth last week in a directive to BP. Both the failed blowout preventer and the capping stack will be brought to the surface to be examined for evidence to determine what caused the explosion aboard the Deepwater Horizon oil rig on April 20 that killed 11 crewmembers and released more than 4.9 million barrels of oil. Approximately 4.1 million barrels entered the waters of the gulf, while about 800,000 barrels were captured by BP and either flared off or recovered and sent to refineries on shore for processing. Although cement has been pumped into the damaged well from the top there was a risk that oil could be released once the Deepwater Horizon drilling rig’s capping stack and failed blowout preventer were removed. Now that the new blowout preventer is in place, BP can resume operations to complete the relief well that will allow the damaged well to permanently shut in. The Development Driller III drilling rig is on standby in readiness to resume drilling the relief well. The relief well is at a measured depth of 17,909 feet. BP says progressing to intersect with the damaged well will involve drilling, alternating with ranging runs to confirm proximity to the well. Depending upon weather conditions, mid-September is the current estimate of the most likely date by which the relief well will intercept the damaged well, the company said. At that point drilling mud and cement can be pumped into the damaged well from the bottom to permanently seal it in. Meanwhile, more of the Gulf of Mexico was reopened to fishing today. The National Oceanic and Atmospheric Administration reopened 3,114 square miles of Gulf waters offshore of the western Florida panhandle to commercial and recreational fishing. The reopening was announced after consultation with the U.S. Food and Drug Administration and under a re-opening protocol agreed to by NOAA, the FDA, and the Gulf states. At its closest point, the area to be reopened is about 55 miles northeast of the Deepwater/BP wellhead. 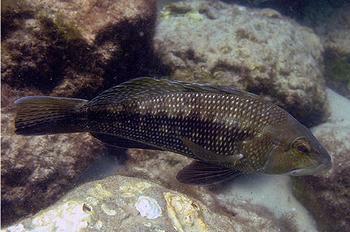 The total area is about one percent of federal waters in the Gulf of Mexico. Between August 20 and August 24, NOAA sampled the area for finfish such as tuna, swordfish, and mahi mahi. Sensory analyses of 104 samples and chemical analyses of 101 specimens found no detectable oil or dispersant odors or flavors, and chemical analysis found evidence of these contaminants “well below the levels of concern,” NOAA said. NOAA will continue to take samples for testing from the recently reopened area and the agency has also implemented dockside sampling to test fish caught throughout the Gulf of Mexico by commercial fishermen. The closed area now covers 39,885 square miles, or about 17 percent of the federal waters in the Gulf, which was 37 percent at its height on June 2. The boundary of the fishery closure has changed 27 times after it was first instituted on May 2, at which time it covered about three percent (6,817 square miles) of Gulf waters around the wellhead. In addition, on September 2 NOAA reopened 5,130 square miles off the western Florida panhandle, Alabama, Mississippi, and eastern Louisiana.